Trout, Steelhead, Bass, Blue Fill, Carp, a fisherman never knows what kind of fish he will be chasing from day to day. To be prepared, all fisherman need a "Go To box." A box that will allow you to fish for whatever and whenever the opportunity presents itself. With a detachable swing lead, positive latch, and sure grip exterior, hundreds of flies can call this box home. Trout, Steelhead, Bass, Blue Fill, Carp, a fisherman never knows what kind of fish he will be chasing from day to day. To be prepared, all fisherman need a "Go To box." A box that will allow you to fish for whatever and whenever the opportunity presents itself. With a detachable swing lead, positive latch, and sure grip exterior, hundreds of flies can call this box home. 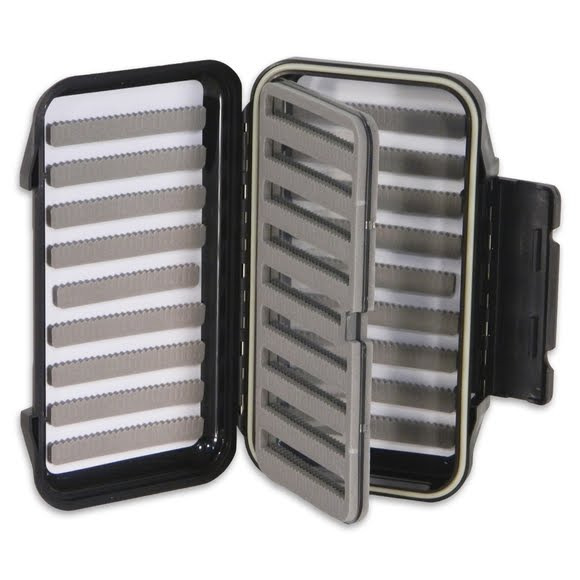 This is a rugged, durable, watertight box that anglers will utilize for years. Dimensions 7.5" x 4.5" x 1.75"